Note to our readers : Adobe Flash Media Live Encoder is NO longer a recommended encoder at DaCast as it is being depreciated by Adobe. As a free encoding software alternative, we recommend OBS Studio and you can access how to use it here. Looking for streaming solutions for your broadcasts? 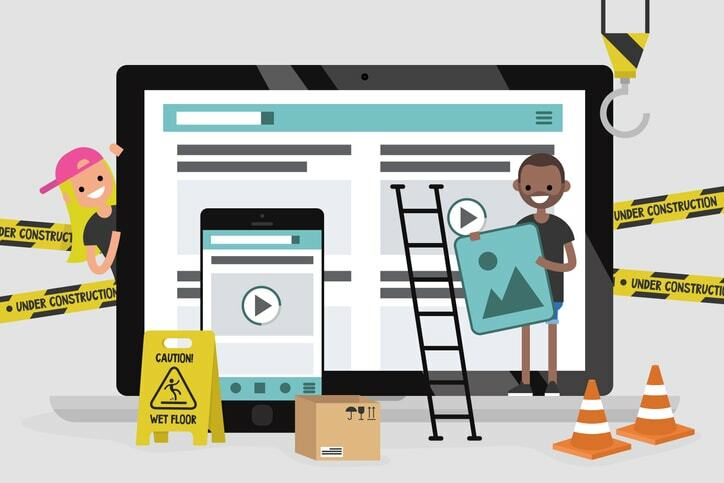 Want to stream live video on your website? Looking to do professional or business-related live streams on a regular basis? Look no further! Encoding is one of the crucial steps in live streaming, and we’re here to help. In this post, I’ll show you how to encode for your live video streaming project. 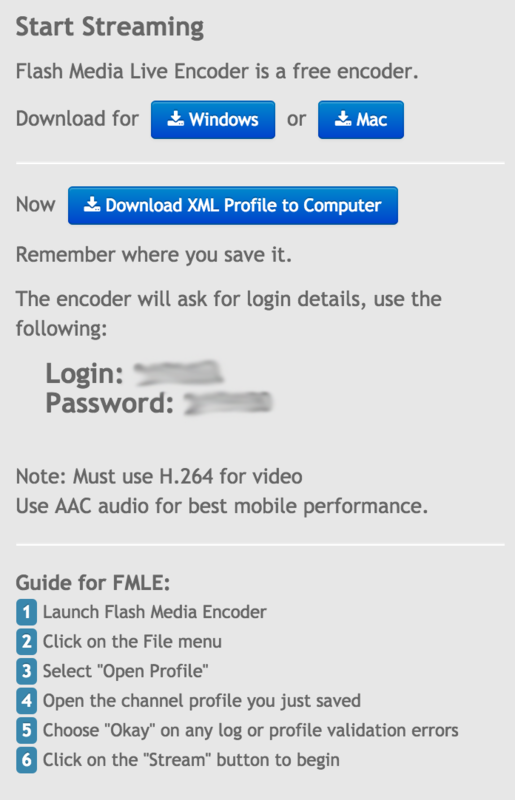 What follows is a step-by-step guide on how to use Adobe Flash Media Live Encoder (FMLE) for live streaming with DaCast. Flash Media Live Encoder is a widely used software encoder, being the only free RTMP live encoder. Let’s dive right into setting up your stream through your DaCast account! 1. Set up a live stream in your DaCast account. If you’re just getting started with live streaming, read more here for a walkthrough on how to set up a live stream. 2. Download the XML profile in the Encoder Setup page. Save the login and password from the XML profile. You will need to input the 6-digit login and password in FMLE. These are unique to each live channel and are not the same as your email login and password. 3. Download and install Adobe Flash Media Live Encoder. You can download it directly from the DaCast page. If you want to know more about FMLE, you can visit the product page here. At the top of the program, click File then Open Profile. Use the XML profile you just downloaded. FMLE will, by default, choose an XML profile called ‘startup’ in a folder named ‘Flash Media Live Encoder X.X’ (X.X is the version number). This is not the correct XML profile and you need to make sure that you choose the XML profile you downloaded from DaCast. Click OK when “Profile Validation” appears. Sometimes you may get a few error messages, but you just need to click OK each time. Use your XML login and password to connect. The interface is divided into input and output areas. The input area is then divided by audio and video settings. You can change the settings according to your preference or you can also just use the presets. 5. Choose your video settings. Once you connect your video device to FMLE, you can configure the settings. Check out this list of cameras that have been tried and tested to be compatible with FMLE. 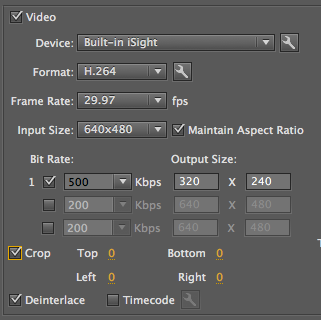 In the video settings, you can change the format, frame rate, bitrates, input size, and output size. Format: FMLE can stream in both H.264 and VP6 formats. For DaCast, we recommend using H.264 format. If you plan to broadcast to mobile devices, using the H.264 format is necessary. Frame Rate: The frame rate is the speed of recording and the speed of playback of your input device. You should choose a frame rate that matches your video camera. This is usually in the region of 30.00 fps. Input Size: This is the size that FMLE will capture video from your input device. This should generally match the output size. Bit Rate and Output Size: Your bit rate should be set on your level of available bandwidth. 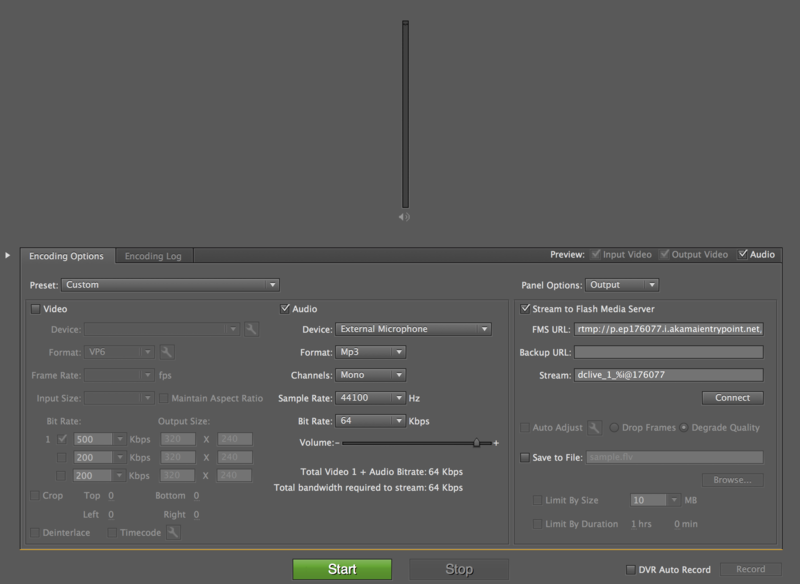 Your output size should match the size of the video player you’re encoding for. Here are some rough guidelines on output size and bit rates. You can also read more here for bit rates guidelines. 6. Choose your audio settings. The recommended audio format is AAC for optimal results. Format: You can use either MP3 or AAC, but AAC is the preferred format for optimal streaming. MP3 may not work as well as AAC on mobile streaming, especially for iOS devices. Channels: Stereo is usually the better choice. A mono channel uses only a single channel while stereo uses two or more audio channels. Stereo has almost completely replaced mono because of the increased sound quality. Sample Rate: This is the number of audio samples carried per second. 44.10 kHz is the standard choice for audio sample rates. 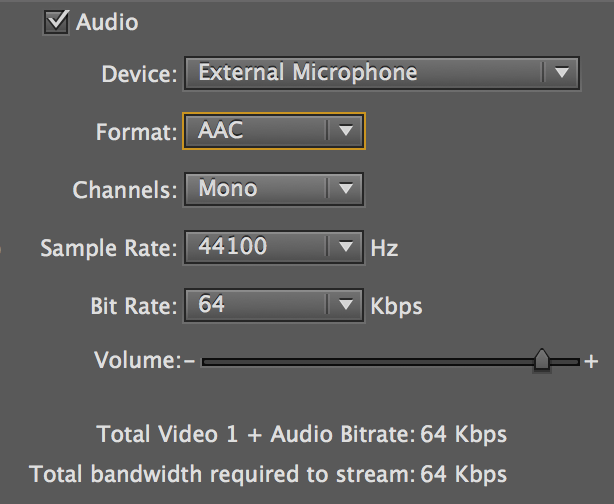 Bit Rate: For higher quality broadcasts, you can start from 96 Kbps. For lower quality broadcasts, 48 Kbps or 64 Kbps should work fine. 7. Configure your output stream. 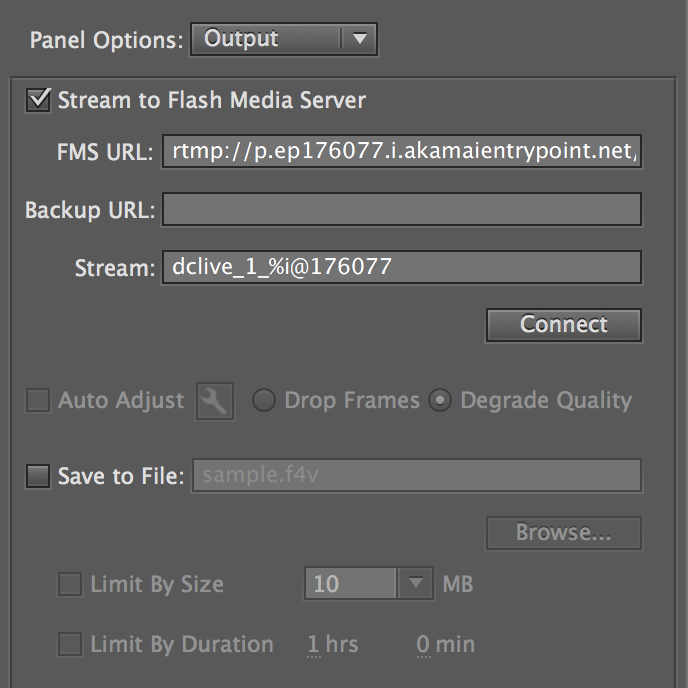 In order to stream to DaCast using FMLE, you need to check “Stream to Flash Media Server” on the output area. Your FMS URL will automatically be filled up when you log in with your XML profile. You can also choose to ‘Save to File’ if you want a copy of your live broadcast. This will create a local copy you can save on your hard drive and use it to upload as a video-on-demand on your DaCast account. 8. Start your live broadcast! Once you’ve configured all your encoding settings, you can now start your live broadcast. Just click the green Start button, enter your XML login and password and you’re good to go! Need a quick fire demonstration? Here is a quick gif showing steps 4, 7 and 8 which deal with opening the XML and launching the broadcast. And there you have it. You should be streaming live on your own from your own account within the DaCast online video platform! Did you find this walk-through helpful? Are there other tips or topics you’d like us to cover? Let us know you questions and feedback in the comment section below. We love to hear from our readers, and we’ll incorporate your ideas into revisions or future article posts. For regular tips on live streaming, and exclusive offers, you can also join our LinkedIn group. Did you happen across this article, and you’re not yet streaming with DaCast? You can read more about our live streaming pricing plans to decide which sounds like the right fit for you. If you’re interested to try out our streaming platform for yourself, you can sign up for our 30-day free trial (no credit card required). Just click the button below to get started today! Not readily familiar with an iptv box. Do you need a direct, unsecured link to the stream for that to work? How can i stream a vlc file using fmle ? VLC can play m3u8 links (Pro and Premium accounts only). You can simply copy and paste the link into VLC and it will play automatically.